Picking up from the second part of this series, this blog post will wrap up building an end-to-end API solution. For the first post, you abstracted source systems with APIs to add flexibility, ease of consumption, and increase adoption and integration possibilities. In the second post, you built process APIs, which were based on logical integration use cases from the source systems we have. In this final part of the series, you’ll consume the two process APIs in a new experience API that can perform DevOps processes from Slack via a slash command. We’ll use all of the material learned from the 1st and 2nd issues of this series to build this solution. What is the end service requesting and/or providing? What are the payload requirements for the process APIs we’re going to be calling—data ingressed and egressed? 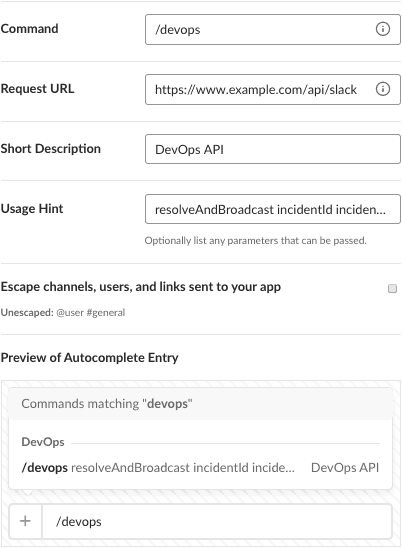 To begin writing your DevOps API spec, you want to ingress a URL encoded payload from a Slack slash command and, on success, respond back to Slack with a JSON that includes the responses from your Broadcast and Incidents APIs. With that in mind, you can start building a RAML definition. Since you know what your responses from the broadcast and incidents API will look like, you can create the following DevOps API specification. Go ahead and import this into Anypoint Studio and start working on building the “DevOps.getstarted” application. Note: If the API specifications weren’t built, an individual/team member would have a long and arduous process of trying to understand the previous APIs before being able to build on top of them. Even with code comments, critical pieces of information go missing. After the application project is created, the first step is always to update the HTTP listener. Use the values you want for your service. When new modules are added to a flow, they can alter/replace the payload variable. In a scenario where we want to persist an object temporarily within a flow, we can use flow vars. %var slashArray = payload.text splitBy " "
For this example, we’re going to consume two process APIs, so we need to include a scatter-gather as one of the paths for our choice router to take. Challenge: Create choices for just a resolve route for your experience API. Use the Flow Ref module where appropriate in your post:/slack flow and create Sub Flows to reuse configuration and code. Looking at your Incident API’s /resolve endpoint that we’ll be calling and the payload from Slack, we’re missing an email of the request. In order to fill that gap, import the Anypoint Connector for Slack from Exchange. This will enable you to make calls to Slack’s API without writing any code. Note: You’ll be updating the URL to the Slack App after deploying this Mule Application with the CloudHub URL. Let’s update the Slack connector in your Mule app to use this token to gain access. 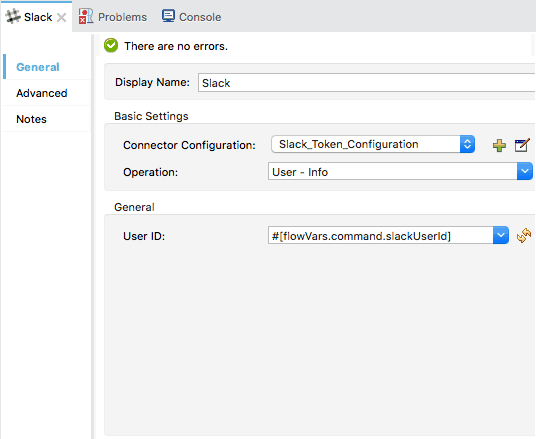 Clicking the “+” to add a new configuration for the connector and selecting Slack: Token Configuration. Paste the token into the textbox and save. Select the operation “user-info” and use the user’s ID to get the user’s e-mail. With the Slack connector in place, you’re now ready to configure the HTTP connectors and set your DataWeave transformations to match the request needs. Starting with the path that has the Slack connector, you’ll need to make the HTTP request to your Incidents API. Going into the configuration, use the incidents API RAML specification from last time. The other flow path in your scatter-gather will be a request to the Broadcast API and require it’s RAML specification. To fulfill your API’s response contract according to the specification, and allow each of the outbound requests to be successful, you’ll need to set the DataWeave transformations. "message": "Did not change incident. Please enter a valid slash command parameter." "message": "Did not broadcast. Please enter a valid slash command parameter." incident_name: flowVars.slash.name + " resolved"
You’re now ready to test your application by clicking the run command in Anypoint Studio. With the Slack slash command app installed in your workspace, run the command (replace mustache). So in this final part of the series, you’ve created a very modular and reusable end-to-end solution that can be repurposed and modified for continued use––especially as business needs change. By separating the process layer logic from the experience layer, you’re able to reuse them for different front-end experiences to be created (e.g. Marketing ops). The API specifications can be modified and given more detail as the application’s needs change. Versioning APIs and their respective specs ensures that existing applications do not break. 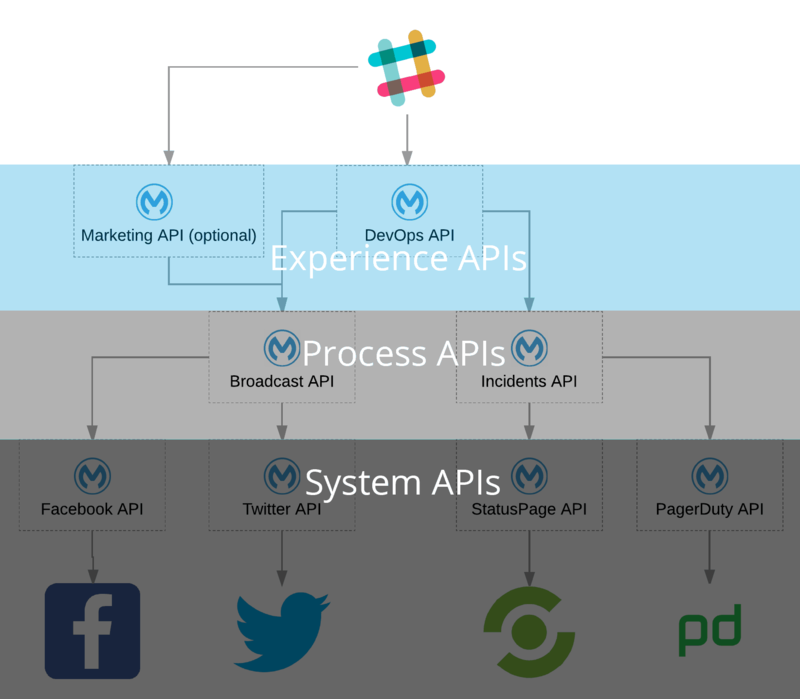 Even adding additional system-level APIs can provide more capabilities and fulfill greater business needs without modifying existing APIs. 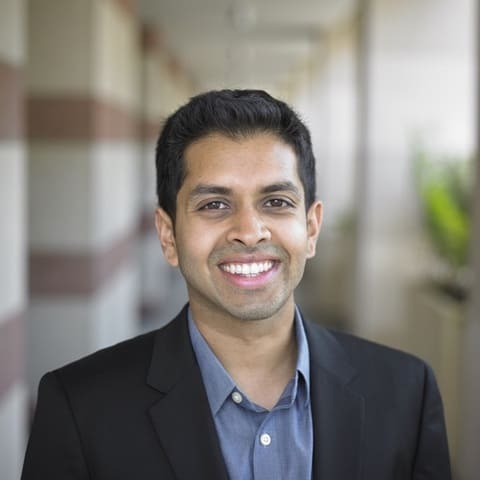 By building well-defined reusable abstractions, you are able to harness the true power of APIs and the inherent flexibility and reuse of existing assets. This allows you to complete integrations and projects faster and faster with each new API added to the list. Security is critical in order to deploy this end-to-end solution into a production environment. You’ll want to secure your individual APIs to prevent unauthorized access. To ensure that requests are coming from a trusted Slack instance, Slack includes validation schemes that can be incorporated into your experience API. With built-in security and prebuilt modules, you can build a reliable & secure production ready solution with very little actual code and roll this solution to your organization. I guess this might be an AWS access issue to be solved? Dennis Hardjo (Novisource, a MuleSoft partner Dutch company). It’s because your session with Anypoint Platform has expired. If you close studio and start it up again, it should prompt you to login to exchange and allow you to download the jar. Are the project available to be used as a model? Also I’m not seeing an architecture for this model solution.